Do not use octree calc. structure: by default, point clouds use an octree-like calculation structure for efficient point manipulation. Inserting points and removing points might be slowed down by this structure. If you enable this item, then point inserting will be more efficient, but the point cloud will not be collidable, measurable nor detectable anymore, and some other operations might also be limited. You can always toggle this item at a later stage, or via sim.setPointCloudOptions. Max. voxel size: the maximum size of the octree voxels, that will contain points. The smaller the size, the more memory will be used for the octree data structure this point cloud is based on. Max. point count / voxel: the maximum number of points a single octree voxel can contain. If more points need to be stored in such a voxel, it will be split into 8 child voxels until the constraint is satisfied. For efficient collision detection, distance calculation and proximity sensor detections, it is recommended to keep about 10-20 points stored in a single voxel. Insert selected visible objects: allows to insert points based on the selected, visible objects. Only dummies, shapes, octrees and point clouds are taken into account. Select all objects you want to insert, then select last the target point cloud object. Shapes will previously be converted to a temporary octree with the specified build resolution. The Insert tolerance item allows to avoid having duplicate points, by specifying a minimum distance tolerance used to decide whether the point will be inserted or not. With an insert tolerance > 0.0 the point insertion will be slower. Subtract selected visible objects: allows to subtract points based on the selected, visible objects. Only dummies, octrees and point clouds are taken into account. 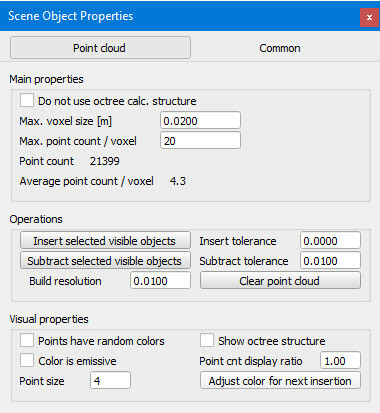 Select all objects you want to subtract, then select last the target point cloud object. Dummies and point clouds will use a subtract tolerance value to identify points to remove. Clear point cloud: removes all the points from the point cloud. Points have random colors: each point will have a random color. Show octree structure: shows the underlying octree data structure, mainly for debugging purposes. Color is emissive: points will be shown in emissive colors. Point cnt display ratio: point clouds that contain a large number of points might slow down the rendering. By setting a ratio smaller than 1, a smaller amount of points will be displayed for each octree voxel that contains points. This has only an impact on the displayed/rendered image. Point size: the size of points, in pixels. Adjust color for next insertion: allows to select a new color, which will be used for new point insertions.